Brooklyn's awash in great flea markets that sell vintage clothes, antique housewares, and cameras, old jewelry and retro, mid-century modern furniture and more. Looking for an old phone or Remington typewriter? A retro chair that needs refinishing, or a 1940s plant stand that doesn't? You can buy or bask in the romance of the retro at Brooklyn's many flea markets. Whether you intend to just browse or are really wanting to buy, Brooklyn Flea is a bellwether of trendy Brooklyn culture. On Saturdays in the spring, summer and fall, the fabulous Brooklyn Flea market sets up shop under the archway in Dumbo. The flea also has a new location in Manhattan. On Saturdays and Sundays, you can find it in DUMBO. Vendors sell old furniture, photos, cameras, clothing, old objects, and jewelry here. But you can also just come and eat! For instance, you can enjoy Brooklyn Fish Camp oysters, locally-made ice cream, and other treats. The atmosphere is festive, prices are fair, and the people-watching is fun. Brooklyn Flea is a good place to meet friends. And, don't be surprised if you make a few new ones here, too. 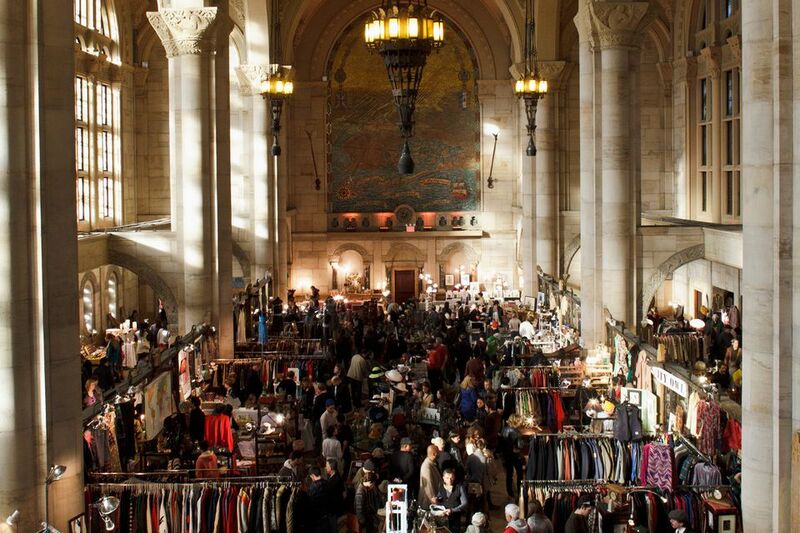 In the winter, Brooklyn Flea is held in a spectacular venue, inside a historic building that was once known as the Williamsburg Savings Bank. The high vaulted ceilings, with tile inlay, are gorgeous. It's worth the trip for this architectural treat alone. The PS 321 Flea Market, in the heart of Park Slope on Seventh Avenue, has been in operation for decades. It is open for business on both Saturdays and Sundays. The playground market (with a jungle gym in the middle of the site) has an eclectic collection of vendors selling clothes, art, jewelry, kitchen wares, watches, vintage postcards, rugs, and furniture that ranges from great vintage pieces to shabby chic to junque. Prices can be negotiated. The best flea market of all in Brooklyn are the one-off, individually-run stoop sales that take place on good weather weekends across the borough. Here's where you can find cheap vinyl records, great clothes, affordable good toys for kids, office furniture, tables, and chairs—just about anything that the average person is strong enough to schlep out of their apartment and onto the street. Some stoop sales are advertised on Craigslist. Often, in Park Slope and other neighborhoods, people simply stick up signs on the lamp posts or advertise their stoop sale with a chalked message on the sidewalk. Prices are always dirt cheap. And, when buying from a stoop sale, you have a very good idea of where that vintage teapot or child's lamp in the shape of a balloon came from. With vendors selling everything from vintage clothing to handmade jewelry, this flea market has long been a neighborhood favorite for weekend browsing. Artists and Fleas has locations in Brooklyn and Manhattan, since 2003, this Williamsburg market has been home to some of the best creative artists and designers in the area. Open weekends and located in the heart of Williamsburg, the market is the perfect spot to pick up jewelry, records, clothing, and other goods. Every Memorial Day weekend, there's a three-day African bazaar at the Brooklyn Academy of Music. It's not exactly a flea market, though some of the merchandise is gently used or old. Rather, it's a global market of vendors selling African, Caribbean, and African-American food, crafts, and fashion.